To mark the centennial anniversary of the Panama Canal’s completion, the Truman Library Institute has created and launched an original exhibition highlighting the presidential past of the isthmian passageway. 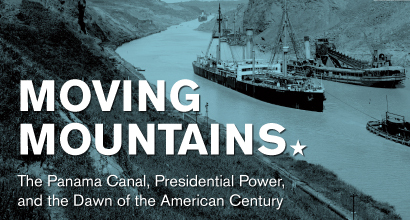 Moving Mountains: The Panama Canal, Presidential Power and the Dawn of the American Century draws on the rich history preserved in our nation’s presidential archives – including the Truman Library – to share a story which is much broader than the creation of the Panama Canal. It is the story of America itself and the underlying spirit of achievement that has made this nation great. The exhibition is on display at the Truman Forum, located within the Plaza Branch of the Kansas City Public Library. Members enjoy free Museum admission, not only at the Harry S. Truman Library and Museum but all Presidential Libraries of the National Archives. Plan your next Museum visit.